The quaich (pronounced quake) is the traditional Scottish cup of friendship. 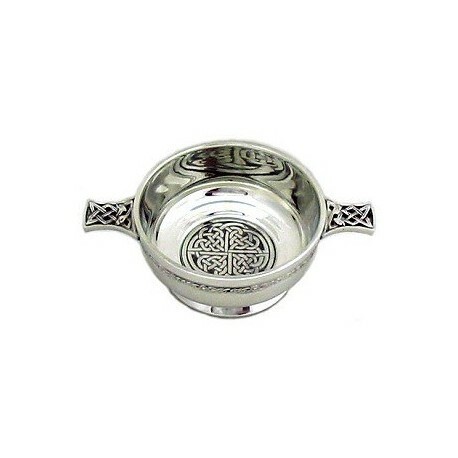 This polished pewter quaich features Celtic knotwork designs on the bowl centre, handles and band around the outer surface of the bowl. The quaich (pronounced quake) is the traditional Scottish cup of friendship. 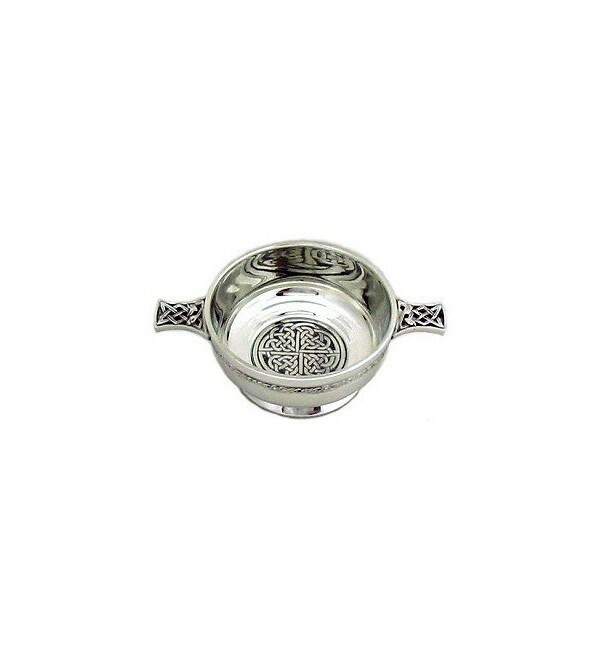 This polished pewter quaich features Celtic knotwork designs on the bowl centre, handles and band around the outer surface of the bowl. The 9 cm diameter bowl would be considered a medium size quaich. Includes presentation box with a brief background of the quaich. Quaich is a Scots rendering of the Gaelic word "cuach", meaning a cup. Centuries ago, they were built of wooden staves, and by the 17th century were often mounted in silver or made entirely from the metal. Quaichs were used for whisky or brandy, and in the 19th century Sir Walter Scott dispensed drams in silver-inlaid quaichs, but the one he kept himself was particularly precious to him ... in 1745 it had travelled from Edinburgh to Derby with the Scottish Army in Bonnie Prince Charlie's canteen. Its bottom was originally made of glass so that the drinker could keep watch on his companions. Used for visitors welcomes or a farewell cup by proud Clan Chiefs, worthy merchants or humble crofters, the quaich has kept its simple but beautiful shape and friendly purpose.